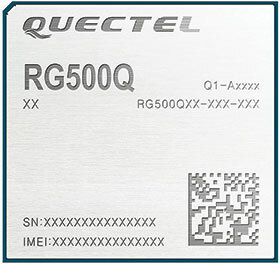 Quectel Wireless Solutions announced commercial 5G IoT modules featuring the Qualcomm Snapdragon X55 5G modem and antenna modules with integrated RF transceiver, RF front-end and antenna elements. Designed in LGA form factor, the RG500Q supports the 5G NR sub-6 GHz band while the RG510Q supports both 5G NR sub-6 GHz and millimetre-wave spectrum bands. They are compliant with 3GPP Release 15 specifications and capable of both 5G standalone (SA) and non-standalone (NSA) modes of operation. Variants of both modules also support LTE Category 12 or above and embedded GNSS capabilities. The RM500Q and RM510Q are module variants in the M.2 form factor.